Dragon vases of this type appear with both underglaze-blue and copper-red decoration, although it is rare to find a blue and white example with Kangxi reign mark. The closest comparisons to the present vase are the examples with identical design and Kangxi marks, an ovoid vase of slightly more elongated form in the Beijing Palace Museum, illustrated in Kangxi Yongzheng Qianlong, Hong Kong, 1989, p. 23, pl. 6; one from the Shanghai Museum, illustrated in Kangxi Porcelain Wares from the Shanghai Museum Collection, Hong Kong, 1998, pl. 12; and another with a slightly more elongated body, from the Wang Xing Lou Collection, illustrated in Imperial Perfection, The Palace Porcelain of Three Chinese Emperors, Hong Kong, 2004, no. 1. 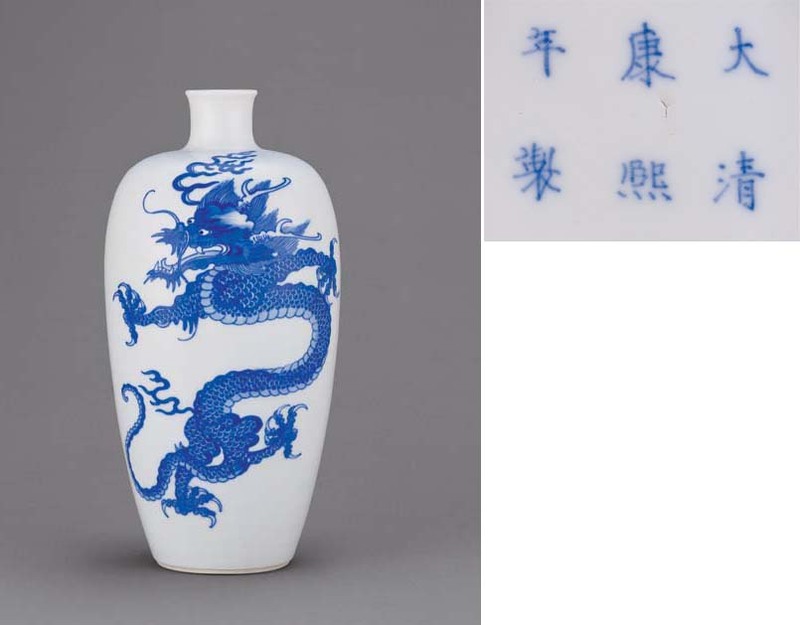 Of the dragon vases without Kangxi marks, a similar pair inscribed with Chenghua marks, was included in the Exhibition of Ming and Ch'ing Porcelain from the Collection of the T. Y. Chao Family Foundation, Hong Kong Museum of Art, 1978, Catalogue no. 83; while another blue and white vase of this pattern with an apocryphal Xuande mark, from the collection of S. Junkunc III, was included in the Los Angeles Exhibition of Chinese Ceramics, 1952, Catalogue no. 369, where another in the Art Institute of Chicago is recorded. Compare also the vases of this form and pattern with Kangxi marks, but painted in underglaze-red, one of more meiping shape in the Shanghai Museum, illustrated op. cit., 1998, pl. 70; one in the Baur Collection, illustrated by John Ayers, Chinese Ceramics in the Baur Collection, Vol. 2, Geneva, 1999, pl. 146 [A527]; one from the Sir Harry and Lady Garner Collection, included in the Oriental Ceramic Society Exhibition, Arts of the Ch'ing Dynasty, London, 1964, Catalogue no. 108; one from the Walters Art Gallery, Baltimore, illustrated by Stephen Bushell, Oriental Ceramic Art, New York, 1897, fig. 225; and another, also more of a traditional meiping shape from the Asian Art Museum of San Francisco, illustrated by He Li, Chinese Ceramics: A New Comprehensive Survey, San Francisco, 1996, p. 286, pl. 576. A vase decorated in both red and blue but with the same pattern is in the Percival David Foundation, illustrated in Oriental Ceramics, Kodansha Series, vol. 6, Japan, 1982, pl. 208; while a larger vase with the addition of underglaze-blue waves is also illustrated ibid., col. pl. 49. The five-clawed dragon continued as an imperial symbol during the Qing dynasty, and its use was even more severely restricted than in the Ming. The rendition of the dragon on the present lot is characteristic of that in the Kangxi period, which is exemplified by a fierce and powerful demeanour giving an impression of authority and majesty, with finely detailed painting of the head and scales. This is a considerable development from the more freely drawn and often, more simplified, versions of the late Ming dynasty. The full-faced representation of the dragon already existed in Ming times, and became popular in the Qing, but it is from the Kangxi period onwards, as evident from the present lot, that the dragon was imbued with a greater sense of vitality and martial spirit.